This Belleek ornament is the 21st in the series, introduced in 2008. The fine Irish china Belleek Pottery ornament is the 21st in the series and it is the Belleek 2008 annual Christmas ornament bell. The Belleek Pottery ornament is fashioned after its name sake on the banks of the River Erne in County Fermanagh, Ireland. The fine china reproduction of this 19th Century building features hand-painted green shamrocks along with an embossed windows and base. 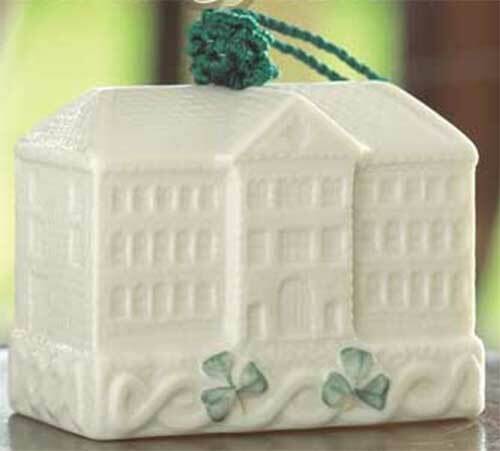 The Belleek annual ornament measures 2 3/4" tall and it is hand crafted in Belleek, Ireland. The 21st Annual Bell Ornament is a miniature replica of the Belleek Pottery main building erected in 1858. Robert Williams Armstrong, founder of Belleek, designed the building.